January 2017 - An Opportunity to Celebrate Life! January is getting off to a fast start! We kicked off the year with our own week of visioning and planning. 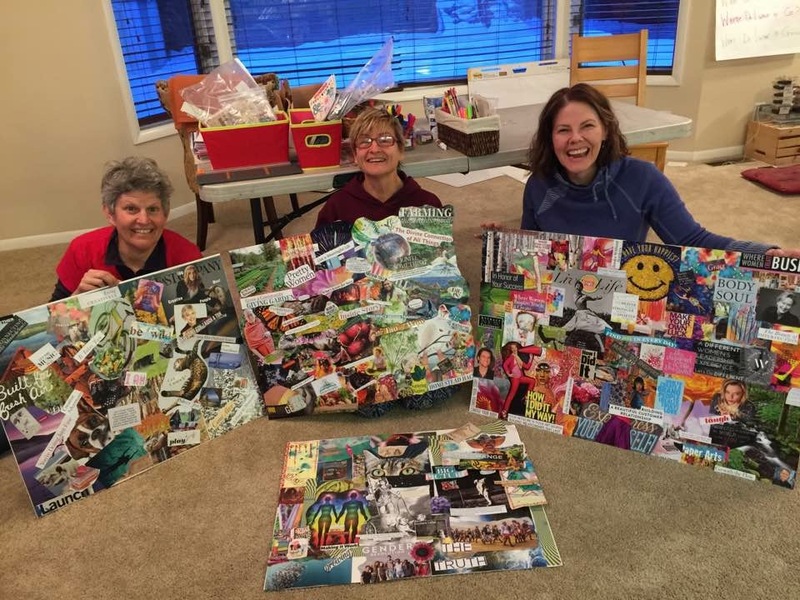 I’ll add our vision boards here because they were fun to create and I think captured each of us, meaning CrisMarie and I, as the unique people we are and our interest together. We’ve also been into the final edits for our book, The Beauty of Conflict, Harnessing Your Team’s Competive Advantage! It is exciting and it has been a journey! We are hoping to launch in March!! We have a number of team client gigs happening. We were up in Victoria working with Biocybernaurt. What an amazing team of folks with quite an awesome offering. This company works with neurofeedback and assisting people learning to tap their alpha brain waves to work through trauma, problem-solve and take the learning into their lives. We’ll get a chance to try the technology and I am sure looking forward to seeing the possibilities!! Soon we’ll be heading to the east coast to work with SkillsUSA. I love their mission: to empower its members to become world-class workers, leaders and responsible American citizens. At this point in our country this is really needed and timely! We’ll also be continuing with Wolfe Mining – we love these guys and grateful to get to keep working with Terri! So lots happening with thrive! I am also excited about being at the Faculty/Assistants Weekend happening starting this friday at The Haven. I love the energy of having faculty and assistants join together and engage in ideas, connection and ways of continuing to energize The Haven! So there’s a lot. Sometimes I can feel a bit overwhelmed and spin in too many directions. I admit with the book, our different blog post and regular 406 articles, I find keeping up on my personal blog quite challenging. Also my own writing project can take a backseat to everything else. It is is hard to keep my focus and ensure I am addressing the right priorities! What I have learned is that even though I resist structure – structure really does help. I had planned at one point to have my word for the year be inspirited. I like that word. However, I think I will be better served to have my word be Structure! There are many dreams I have for 2017. I am also aware that aside from all that is happening in my world – there’s even more challenges/opportunities facing my country, the globe. I don’t want to just spin around the sun this year. Yes, I will be journeying around the sun as I have done now for many years. But I am planning to make this year fun and productive. I think that calls for some structure and a bit of discipline as I go. I will keep you posted. If you want to join CrisMarie and I for a FREE training visit and like our FB page at #THRIVEINCMT. You may also be wanting to ensure you get unstruck and moving on your dreams and goals – if so – check out Build Your Mojo!! Finally, be sure to find your way to The Haven. There’s tons happening there! Take a Come Alive, join Carole Ames and I for Living Alive Phase 1 in April, bring you and your partner to a Couples Alive. These are just a few of the options! The year is moving and as my good friend, Linda Nicholls said recently it is time to Awake Up and Grow Up! I wasn’t too fond of the comment at first. I may have interpreted her statement as a need to be more adult-like. But I have to agree – it’s time. Doesn’t mean I have to leave any parts behind – but I do need to take responsibility and not assume it’s anyone else’s job to deal with or make space for what matters to me. I’d love to hear from you – what’s on you plate for 2017! If you have a word or plan for 2017, let me know! !